Dimensions 0.25 by 7.75 by 9.50 in. Of all the modern holiday classics, this is perhaps the best known and best loved. In humorous, sonorous, nostalgic prose, Dylan Thomas recalls the church-going, the tree-trimming, the food, the carols and games, not of one childhood Christmas but of them all: he distills here the Perfect Dream of Christmas. For this edition, the immortal Edward Ardizzone produced 30 delightful watercolors and drawings (and if you're clever you can recognize Cardiff as the Welsh town in which the story is set) as a perfect counterpoint to Thomas's lilting words. With Fritz Eichenberg | from New Directions (October 1, 1995); titled "A Child's Christmas in Wales"
About: A holiday classic captures a child's-eye-view and adult's warm remembrances of the holiday season landscape, portraying a time of gift giving, good things to eat, and newly fallen snow. With Edward Ardizzone (other contributor) | New edition from Orion Pub Co (September 30, 1993); titled "A Child's Christmas in Wales"
About: This miniature edition is a celebration of the author's childhood and Christmas in a small Welsh town. With Fritz Eichenberg (other contributor) | Min edition from Running Pr Book Pub (September 1, 1993); titled "A Child's Christmas in Wales"
About: Poetic remembrances of Christmases past are illustrated with the classic woodblock engravings of Fritz Eichenberg in this new edition of the enchanting holiday tale. About: A Welsh poet recalls the celebration of Christmas with his family and the feelings it evoked in him as a child. With Edward Ardizzone (other contributor) | from David R Godine Pub (October 1, 1980); titled "A Child's Christmas in Wales"
About: A Welsh poet recalls the celebration of Christmas in Wales and the feelings it evoked in him as a child. New edition from New Directions (October 4, 2016); titled "A Child's Christmas in Wales"
About: The classic Christmas tale, with beautiful new illustrations This gem of lyric prose has enchanted both young and old for over half a century and is now a modern classic. from New Directions (November 30, 2007); titled "Child's Christmas in Wales"
About: In print for fifty years, this gem of lyric prose has enchanted both young and old from its very first edition. With Ellen Raskin (other contributor) | Gift edition from New Directions (November 1, 2003); titled "Child's Christmas in Wales"
Ppk edition from New Directions (April 1, 1996); titled "A Child's Christmas in Wales"
With Fritz Eichenberg (other contributor) | from New Directions (November 1, 1995); titled "A Child's Christmas in Wales"
Reprint edition from David R Godine Pub (September 1, 1984); titled "A Child's Christmas in Wales"
With Christopher Raschka (other contributor) | Reprint edition from Candlewick Pr (September 24, 2013); titled "A Child's Christmas in Wales"
About: Fifty years after its first publication in book form, Dylan Thomas's timeless prose poem is echoed by the rolling, evocative images of Caldecott Honor artist Chris Raschka — a beautiful gift for book lovers. 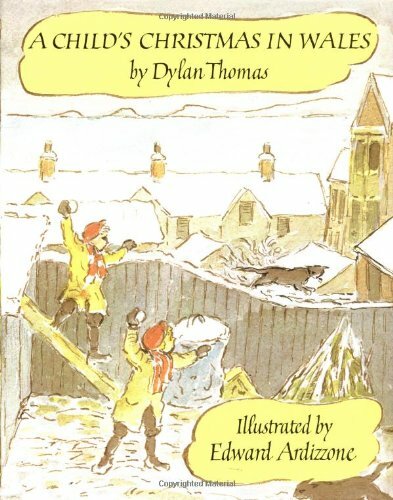 With Christopher Raschka (other contributor) | from Candlewick Pr (October 30, 2004); titled "A Child's Christmas in Wales"
About: The Welsh poet Dylan Thomas recalls the celebration of Christmas with his family and the feelings it evoked in him as a child. With Trina Schart Hyman | from Holiday House (July 1, 1985); titled "A Child's Christmas in Wales"